Django is a high-level Python application framework built for development speed and accuracy. With a flatter learning curve than most frameworks, Django quickly enables you to create elegant, performant applications. In this book you will jump into Django by creating a web application step by step. Offering you a quick but comprehensive immersion into the world of Python development, Instant Django 1.5 Application Development Starter begins with a practical exploration of the framework’s powerful mechanisms and tools and finishes your journey by taking you through the creation of one sample application. 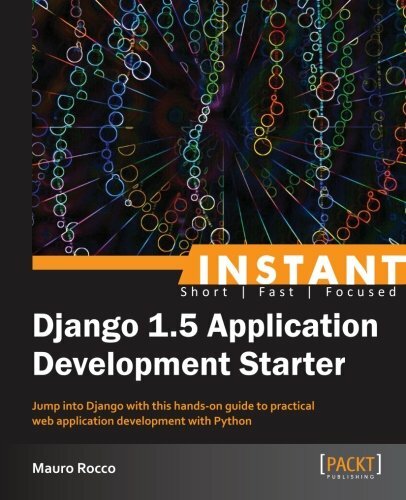 In "Instant Django 1.5 Application Development Starter" you will learn how Django’s components work together. You will get familiar with the powerful template system, and will discover how easy it is to generate a web administration interface for your project. You will learn how to work with user authentication, forms, and session management. Through this book you will learn everything you need to know to create stunning web applications in a very short time, taking advantage of all the beauty and power that Python has to offer. If you want to start building serious web applications using Python, this book is all you need. Get to grips with a new technology, understand what it is and what it can do for you, and then get to work with the most important features and tasks. This book is written in a practical Starter style with lots of helpful screenshots and step-by-step tutorials which will guide you gently into the world of Django. This book is for Python developers who want to jump into the world of Django. If you want to create awesome Python web applications without sacrificing speed then this book is for you. This book will also appeal to people learning Python who wish to hit the ground running and develop Python applications quickly and efficiently.